Created with the traditional colors of Obatala…this bracelet is so beautiful to look at. 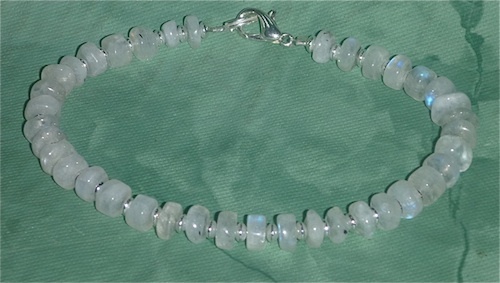 The rainbow moonstones just glow with this wonderful light that brings you into a space of peace. It is as though you know that with the soft light that refracts from it…you will have what you need. The energy matrix of Obatala truly puts you into a great position to see what is possible within your chosen destiny path. Connecting to all of your life's adventure with a more peaceful mind…truly makes a difference! Ase. Each one is consecrated in the sacred shrine at the Ola Olu retreat. Each one is blessed in your name so you can triangulate at a much higher level with the Obatala energy while wearing it. The materials are all natural and feel really good to the touch of your skin. Try one and see. Great gift for someone you love as well.